When we go out to eat we always get some bread as a starter. But strangely enough we never get garlic bread of any kind. If we are lucky we get some garlic butter on the side but for some reason we never get crusty garlic bread. 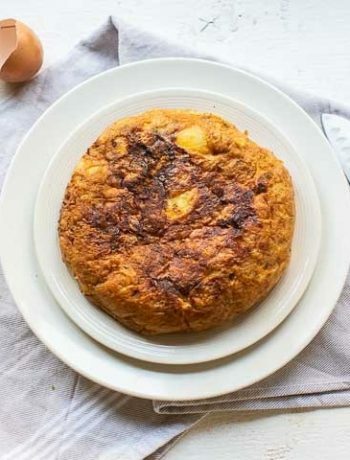 If you try this recipe you will see that this is a missed opportunity because this recipe is easy, tasty, crunchy and delicious. With only three ingredients. 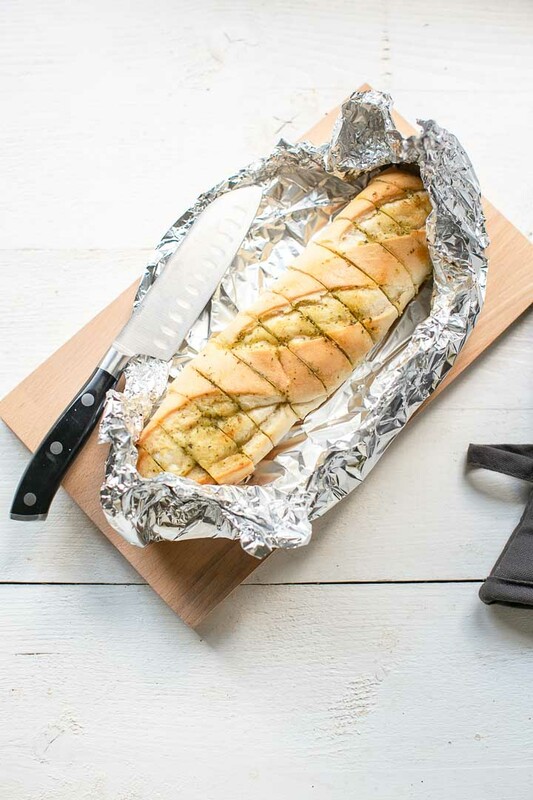 This garlic bread recipe is of the kind that want to keep around at all times. 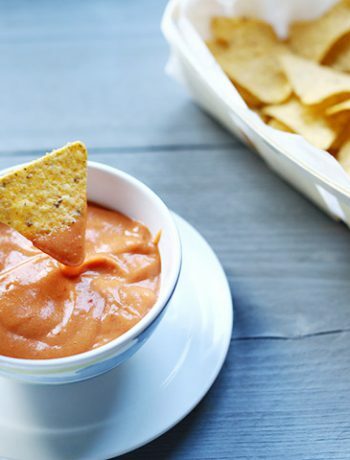 Prepare it, store it in the freezer and take it out when you get unexpected guest. You can make your own baguette but allow me to share a secret. 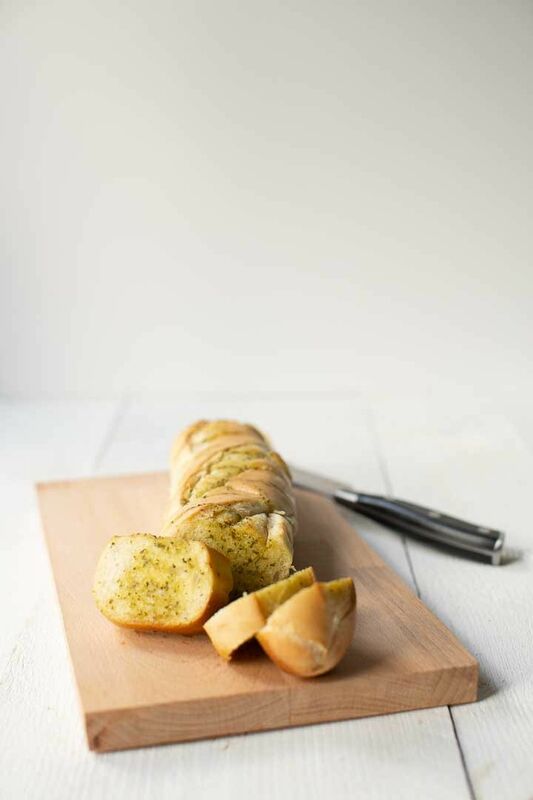 Make this garlic bread with pesto and the cheapest baguette you can find. Preferably a soft pre-baked baguette. Opposed to the cheesy crack bread that required a crusty bread you now need a soft baguette. 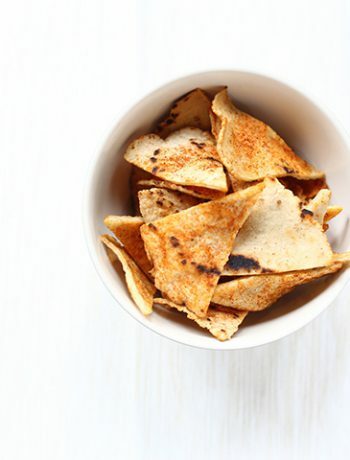 It will allow the ingredients to be absorbed by the bread and get an crunchy crust. To make this recipe the main ingredient is the pesto butter. 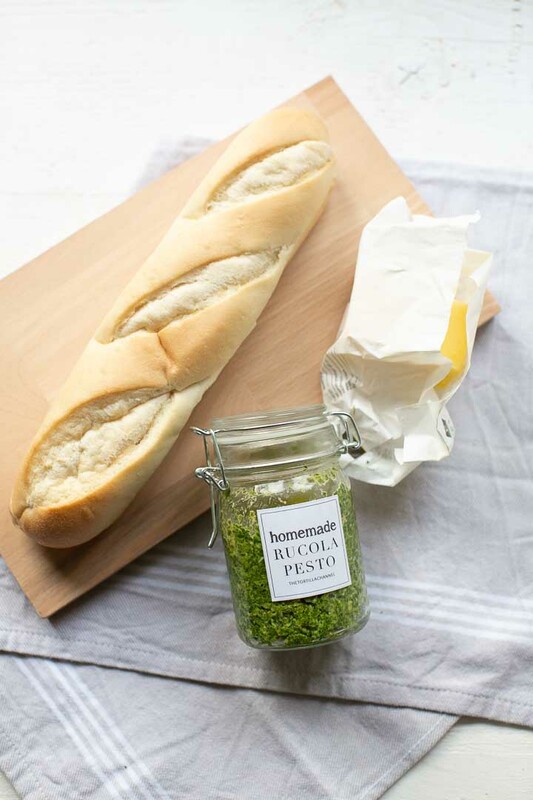 Homemade pesto butter because you can make basil pesto or vegan arugula pesto in no time. It also tastes better so why bother buy this in the store. Take you unsalted butter out of the fridge so it can go a little soft and is workable. Put about 3 to 4 tablespoons of butter in a small bowl. Work it with a spoon to get soft butter before you add a big tablespoon of homemade pesto. Now combine the butter and garlic until you get a smooth garlic butter. Add some salt and pepper to taste. Preheat the oven at 450℉/200℃. Take the soft baguette and cut it in thick slices of about 4 inch/ 2 cm slices but not all the way through. The smear the garlic butter in between the sliced bread. Finish with some garlic butter on top. 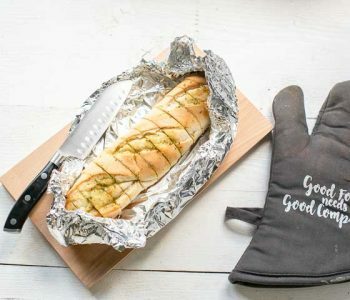 Wrap the baguette with some thin foil and bake in the oven for 15 minutes. 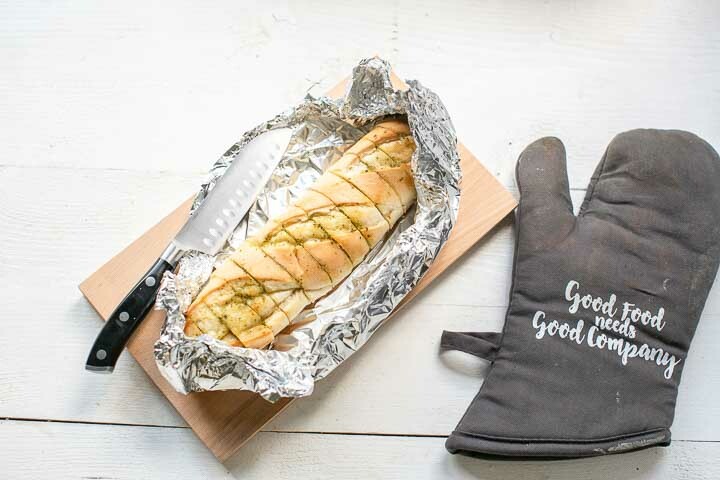 Open the thin foil and let it back for a couple of minutes to get crunchy bread. 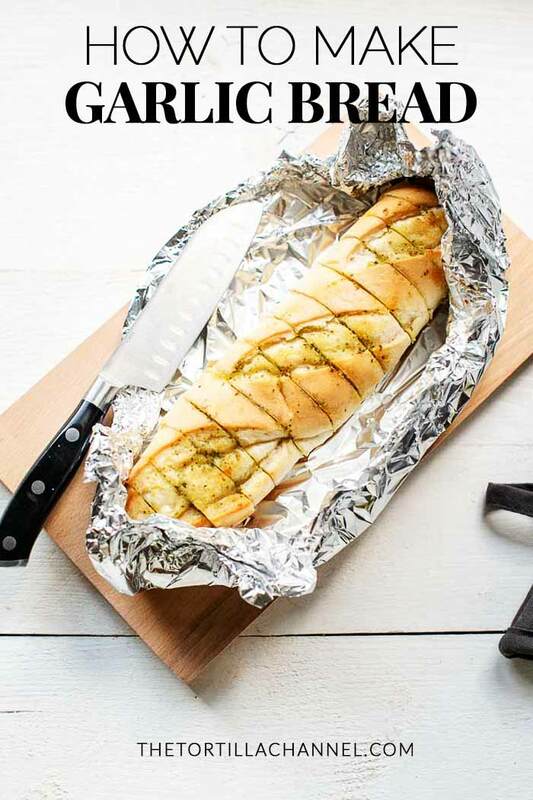 Remove the foil and serve immediately. Add some of the remaining butter on the warm bread. 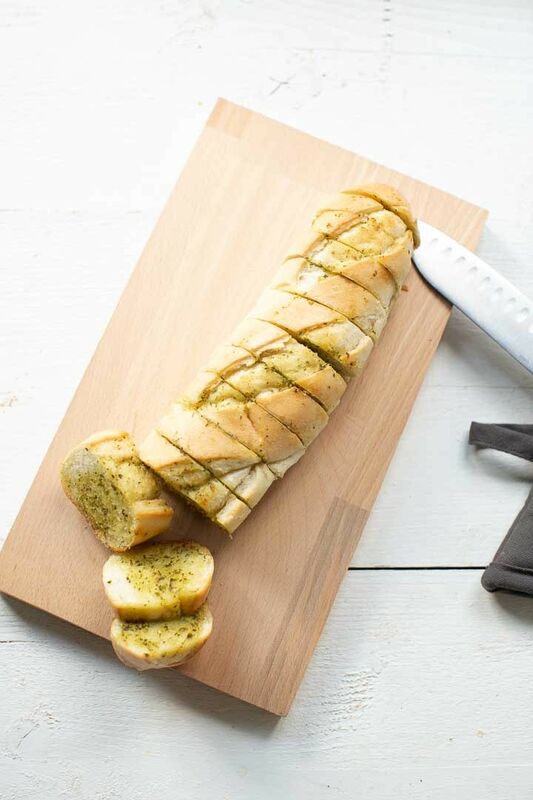 Have fun with this garlic bread recipe! Made a recipe tag @thetortillachannel on Instagram or PIN on Pinterest. 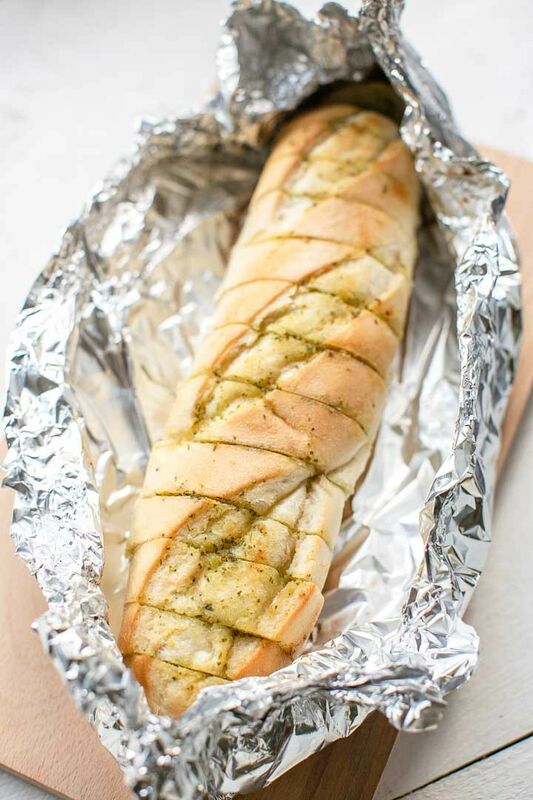 This is a super easy garlic bread recipe with the secret ingredient that is pesto. Take some fresh butter and baguette and turn it in to heavenly bread.